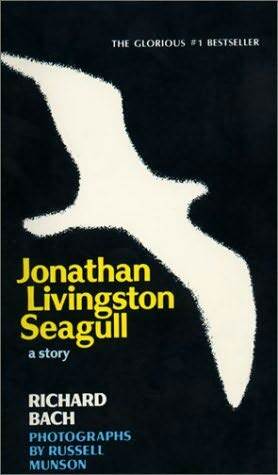 Remember ‘Jonathon Livingston Seagull’ and all of those other books? For those of us over 50…. Remember how the book stores once had very few Self Empowerment / alternate thinking books? How Jonathon Livingstone Seagull inspired us to fly beyond the flock and then I’m Okay- Your Okay came out. I was a teenager then and didn’t really understand it but carried it around for months like an affirmation of somewhere I would be one day! Then there was the Primal Scream by Arthur Janov who told us that we had every unshed tear and soul wound trapped in our body and the sale in beanbags quadrupled as therapists across the globe created little spots for people totanguish-out their pain. One flew Over the Cuckoos Nest let us all know that really, madness was quite okay and it was the drugs and Nurse Ratchetts of the world who were messing things up. And then Shakti Gawain brought the Science of Mind / New Thought teachings out of their niche and presented them in a much more contemporary, relevant format. We were so ready for her book! I know I sure was. Creative Visualisation was the key to making dreams come true and for many of us was a pivotal, turning point moment when we found her book or perhaps, as it seemed, it found us!! Some of of us then did months / years of Women who love too much...”How to recognise a commitmentphobic man before he breaks your heart“. Letters from Women who love too much and Ten Stupid Things Women do to Mess up their Life and STILL let another bad boy in because he was such an irresitable pattern to break. Our bookshelves and the dusty boxes in the shed are an archival record of the Journey and it continues ever onward . Later on Paulo Coehlo let us know that the Alchemist did not have to travel anywhere if only he had looked within. In the Celestine Prophecy we were shown how control draaamas and Energy snatching is a way of life amongst the still-sleeping-humans. At this time Deepak Chopra, Wayne Dyer, Louise Hay were beginning to fill the shelves of what one book store assistant referred to as the “heebeejee section” where many of my friends were now spending much of our time. I did not come across Dr Jean Houston’s writings until much later although she is one of the Grand elders of human capacities training. Then there was the high energy interpreter of the change-movement, inspired by Bandlers work as Anthony Robbins bounced across the stage, altering states and appearing with Leeza Gibbons for years on the 2 am infomercials a smany of us took on the challenge of walking across his fire pits chanting “cool moss, cool moss”..
We have laid with tissues next to our Gratitude journals. We have loyally committed to ‘doing what it takes’- sometimes falling asleep with crumpled notes to the Universe and a pile of ‘must read books’ next to our beds. Phew! Aren’t we a wonderful group of Soul School Earth students and aren’t we all blessed that the fruits of our fellow travellers and Soul School class mates becomes the nourishment and ponderings for our own journey…that still has infinitity to go. Some days I browse in the second hand books stores and come across “I’m okay , You’re okay” or a dusty copy of “My Mother Myself” and turn the page of the old fashioned cover with a deep sense of nostalgia and gratitiude that in this dawning of the Age of Aquarius- the Age of Enlightement – we are free to CHOOSE our Soul food and each year produces more and more nourishment and food for thought. And Yes, the astrology, psychic phenomena, astral travelling, tribal wisdom, aura reading, Silva mind development, Healing empowerment books should also get a mention in the Archive. Some more name I have forgotten. John Bradshaw, the dyanamic son of an alcoholic Father showing us how the sickness of the parent is visited upon the child. I also forgot to mention one book that impacted my priveleged white-girl world enormously when I was just 13 – Black Like Me, the diary of a person who changed the color of their skin and shared the reality of racism they experienced having never known it before, in order to make us white-folk really think about the set up we had created and of course Jane Elliotts Blue Eyes, I bought the book, recorded the Oprah Shows and passed on the information whnever and where ever I could. And how could I forget Rolling Thunder Doug Boyds acocunt of the life of the amazing medicine man Shaman who lived in the world of quantum phyiscs, time travel and communiion with Nature. I flew out of my childhood under Jonathon Livingston Seagulls wide wings. I feel a little nostalgic for my Frankincense , Patchouli and beads and ….oh…hang on………that’s right..I am still wearing them. What were the books that shaped your travels and have you bequeathed your library to a fitting new home once your travels in this body have passed?